The Simons Foundation Autism Research Initiative (SFARI) seeks to improve the diagnosis and treatment of autism spectrum disorders by driving research efforts. When the Foundation sought to improve upon their online tools, Six Feet Up integrated various systems into the new SFARI.org. SFARI had a wide variety of user audiences to cater to, including scientists, clinicians, researchers, students, and families affected by autism. They needed to identify and deploy an intuitive navigation structure on their new site, as well as a variety of collaborative tools, so that their visitors could easily find the content pertinent to their needs and interests. 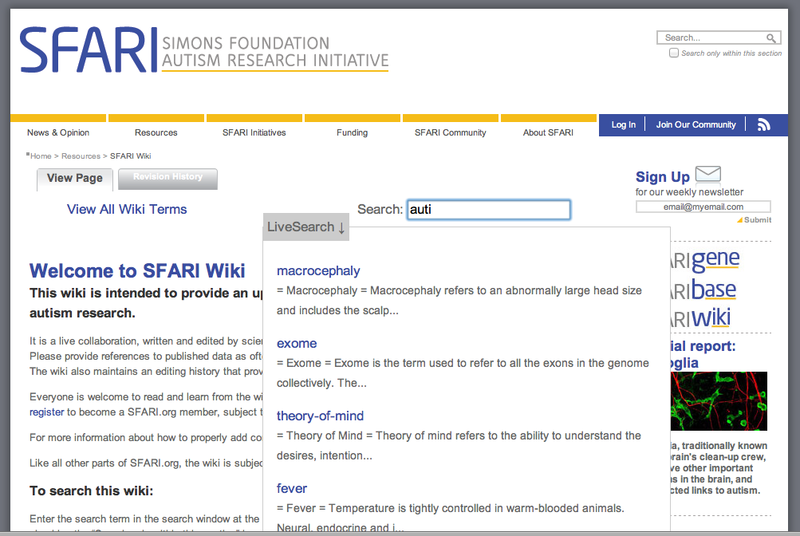 The SFARI Wiki offers the ability for live collaboration so as to provide an up-to-date, searchable reference about concepts in autism research. The SFARI Wiki was set up with MoinMoin, a Python WikiEngine, allowing for authorized users to create and edit wiki pages via their web browser. Researchers and collaborators can create pages that include text, images, links, and various media. Wiki pages are searchable within SFARI.org, making them accessible to the community and public alike. Revisions of wiki pages are stored letting users go back to view the data transformation over time. SFARI.org needed to provide a virtual members' community for users to post questions, discuss areas of research between disciplines and share research before publication. Forums were implemented using Vanilla for its customization and email subscription abilities. Members can subscribe to "My Discussions", "My Bookmarks", "My Comments" and receive notifications when a comment or reply has been posted. Restricting access to only SFARI.org members was one more feature allowing cross-discipline discussions to further research. The Foundation wished to develop a method for invited guest commentators and their staff to be involved in the discussion. Six Feet Up implemented plone.app.discussion and ReCaptcha to enable commenting on news and blog articles while limiting the potential for spamming. This feature also lets the public be involved in the discussion of developing research where insight into a topic is open and free flowing. In order to keep the most up-to-date information on autism research available on SFARI.org, a method was developed using paper types in Plone and cron jobs to pull daily articles and publications from PubMed, an online citation source for biomedical literature. Every night, the newest articles regarding autism (and any other topic SFARI.org wishes to provide) are pulled from the PubMed database and formatted into a template designed for the foundation. Administrators can look through the articles pulled on a daily basis and publish those they feel are critical to research. Through the use of collective.easyslideshow and embedly, SFARI.org offers a variety of rich media elements, such as embedded videos and slideshows, to showcase important content in an accessible format. SFARI can easily add these rich media items to any page on the site, creating a richer site experience for their users. Ease of access to the material available on SFARI.org was critical. Therefore Six Feet Up leveraged Solr to provide a much improved search experience. Using this highly scalable search platform, five distinct searches were incorporated into the site, including live search, normal search, search filtering, section searching, and "did you mean" search. Six Feet Up saved a significant amount of time by utilizing Transmogrifier to migrate SFARI's legacy content via scripts rather than transferring by hand. The Foundation had been powering their old site with Liferay, which was backed by a MySQL database. Thanks to Transmogrifier, Six Feet Up was able to dump the content out of Liferay and pull it into Plone and its ZODB database while maintaining as much of the original content configuration as possible. Throughout the new SFARI.org site, custom templates were developed in Plone to make sure the newest and most recent information could be made available to the public. Listing views were applied to sections, such as news, blogs, autism in the arts, etc., that list articles in order of date published. A related content portlet was also developed to display on news, blogs, etc that offers suggested material that may be of interest to the reader based on the content of the article being read. A custom member profile was also created to allow members to maintain their information on the site so as to make it easy for visitors to connect with each other in the community. Featuring a brand new look and feel, the site offers a rich and interactive experience to users. Optimizing SFARI.org's Wiki, Forums, commenting, information displays and search functions all lead to a successful relaunch. 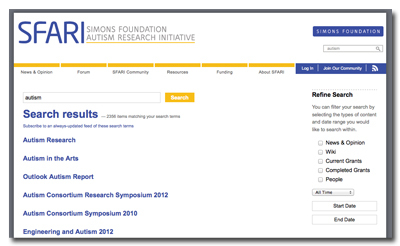 All of the improved site's features make it possible for researchers, foundation staff, and the public to interact and contribute to autism research, furthuring SFARI.org's goals on a daily basis.